I was honoured to be invited to a stunning wedding a few weeks ago. This Bride and Groom are lucky enough to have two weddings! I’m going to officiate for them next year at their ‘party’ wedding – and this first wedding was their traditional Indian Hindu ceremony. Never having attended a Hindu wedding I was very excited, thinking of the very beautiful 90s film Monsoon Wedding and all those colourful Bolliwood movies and copious amounts of marigold flowers! The Groom didn’t enter by horse drawn carriage or elephant as I was told happens at some Hindu weddings, but I wasn’t disappointed, the Groom looked like a maharajah from a bygone era and the Bride was stunning, decorated in gold jewelery with incredible mendhi designs covering her hands. Reading about the origins of mendhi (henna) the decoration ritual is often one of the most important and fun filled pre-wedding ceremonies. And appropriately it represents ‘awakening the inner light, with traditional Indian designs representing the sun. Very fitting for a wedding ceremony. There are a few key rituals common in Hindu weddings – Kanyadaan, Panigrahana, and Saptapadi, which are respectively, giving away of daughter by the father, voluntarily holding hand near the fire to signify union, and taking seven steps with each step includes a vow/promise to each other before fire. 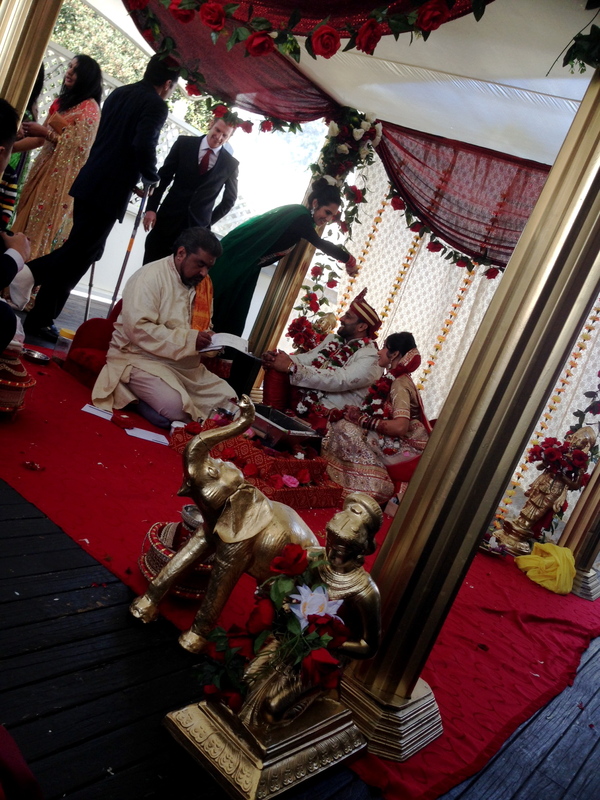 The Hindu wedding ceremony can take up to several hours, with celebrations starting days before and carrying on after. The primary witness of a Hindu marriage is the fire-deity (or the Sacred Fire) Agni. The seven step ritual is the most important ritual. Each step corresponds to a vow the groom makes to the bride, and a vow the bride makes to the groom. The vows are pronounced in Sanskrit in long form, or short quicker form, sometimes also in the language of the groom and bride. In my beautiful Bride and Grooms wedding, this was performed around a fire; and after each of the seven oaths to each other, the groom and bride perform the ritual of agnipradakshinam – walk around the fire, with the end of their garments tied together. The groom usually leads the bride in the walk. After this the couple are considered husband and wife. The other extraordinary thing about the wedding was it was held in a beautifully decorated outdoor altar -during a week of nonstop rain and dark skies – but miraculously the sun shone the entire day for the happy couple! Being a traditional wedding the priest who performed the ceremony spoke mainly in sanskrit, so the only thing I understood was ‘namaste’ which we say in yoga class. The reason behind namaste according to wikipedia is a deep spiritual significance recognizing the belief that the life force, the divinity, the Self or the God in me is the same in all. Acknowledging this oneness with the meeting of the palms, we honor the god in the person we meet. And you know, when you do it, it makes you feel quite centred and humbled. Namaste Mr & Mrs Brij.